Tamarind, a sour paste made from the pulp of the tamarind fruit, and kaffir lime leaves are essential ingredients in a Thai curry. 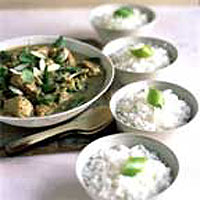 Serve this one with Thai fragrant rice garnished with strips of lime zest. In a bowl, mix 4 tablespoons of the paste with the chicken pieces. Cover and chill for at least 15 minutes. To make the sauce, heat the oils in a large frying pan, then fry the onion on a medium heat for 3 minutes, stirring frequently. Add the ginger and fry for 3-5 minutes or until the onion is soft. Stir in the paste to taste and cook for 5 minutes. Add the marinated chicken and fry for 5 minutes, stirring frequently. Meanwhile, place the tamarind in a jug and pour 150ml boiling water over it. Stir until dissolved. Add to the pan with the coconut milk, kaffir lime leaves and lemon grass stalks and bring slowly to a simmer. Don't boil, as this will toughen the chicken. Simmer gently for about 15 minutes, until the chicken is thoroughly cooked and there is no pink meat. Then add the soy, fish and chilli sauce, the corn and peas. Cook for a further 5 minutes until the corn has softened. Add the mangetout, cook for 2 minutes, then add the beansprouts and simmer for 3 minutes until piping hot. The vegetables should still be slightly crisp. Remove from the heat and discard the lemon grass stalks. Don't cover the pan to keep warm as the vegetables will lose their colour. Transfer to a warmed bowl, sprinkle the salad onions and coriander over and serve immediately. The paste is the key to a good Thai curry. It is easy to make and brings a depth of flavour and fragrance to the finished dish. Using a blender or processor, blend all the ingredients to a smooth paste. Transfer the paste into a bowl, cover and chill until required. This will keep for up to 1 week in the fridge in an airtight container. To freeze, divide into batches in small freezer bags and freeze for up to 3 months.